For those of you worried that Twitter will be axing its iconic 140 character limit, you can relax: CEO and co-founder Jack Dorsey has clarified that the social media platform character limit won't be going anywhere. "It's staying." Dorsey said this morning in an interview on NBC's Today show. "It allows for of-the-moment brevity," he explained, adding that it's a good constraint for the platform. 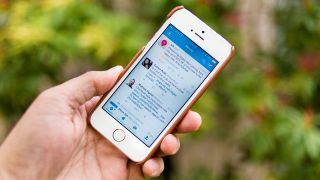 Rumors of Twitter changing its 140-character limit have been popping up since last year after it nixed the character limit for Direct Messages in August. The rumors saw some fuel again after it was announced last month that changes would be coming in hopes to rejuvenate interest in the platform. One change finally arrived this week, as it rolled out a shake up to its timeline feed. It moved from a chronological based feed to one based on an algorithm that shows users tweets that may be more popular or relevant to the user, similar to how Facebook's timeline works. It was met with some outcry last month when it was first introduced, prompting the hashtag #RIPTwitter, and users have been worried over what other changes may be coming. "We're changing a lot," Mr. Dorsey said in the interview today. "We're always going to make Twitter better." What these changes are is still not known, but for now, at least, Twitter will still remain a place for short bursts of information and replies. Besides, everyone knows that MySpace is the undisputed home of all-things-longer than a tweet.